Hot flashes are one of the most common symptoms of menopause. Hot flashes consist of excessive sweating, accelerated heart rate, and flushed skin. Excessive sweating can be extremely disruptive to daily routines. Fortunately, there are ways to relieve hot flashes and excessive sweating. Hot flashes are a sudden sensation of intense heat in the upper body, usually accompanied by an increased heart rate, excessive sweating, and flushing of the face, neck, and chest. Episodes can last from thirty seconds to five minutes, and their frequency and intensity also varies. Nearly 75% of women experience hot flashes as they transition through menopause. They can be inconvenient, and may require you to stop what you're is doing, cool down and even change clothes. The main trigger of excessive sweating during hot flashes is still unclear, but it's thought decreased estrogen levels are the primary cause. Hormonal fluctuations cause the hypothalamus (the area of the brain that regulates heat) to miscalculate the body's temperature. This makes blood vessels near the skin's surface dilate to release heat and perspire, to cool the body down. Consequently, women experience hot flashes and excessive sweating. Hot flashes and other vasomotor symptoms (i.e. related to the constriction and dilation of blood vessels), like dizziness and heart palpitations are less intense and less frequent after a woman has gone through menopause. In fact, most women stop having hot flashes after five years. However, some women continue to have hot flashes and sweat excessively for ten years or more. Wear breathable clothing. This will help prevent your body from overheating. Avoid alcohol, coffee, and spicy foods. All of these things heat your body up, especially near the skin. Alcohol and coffee both cause blood vessels to dilate and contract, a major part of hot flashes. Keep your bedroom cool so that you don't overheat while you sleep. Exercise regularly. This can help keep your body balanced and reduce hormonal fluctuations. Stop or reduce your smoking. This also heats your body up and changes blood vessels, which can trigger a hot flash. Eat healthy. You want to ensure that you're getting all the vitamins and nutrients necessary for optimal body function. Use herbal remedies. Some herbal remedies can help. Before consuming any, make sure that they wont interact with any other medications your currently taking, and research side effects. If you are ever concerned about your hot flashes, talk to your doctor. Follow this link to read more about the treatments for hot flashes. How Can Soy Help Relieve My Hot Flashes? 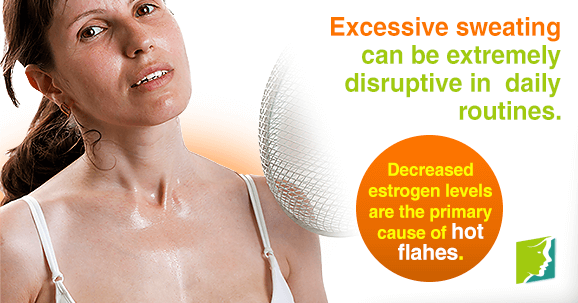 Hot flashes affect about 70% of women who are approaching menopause. They can cause great distress.